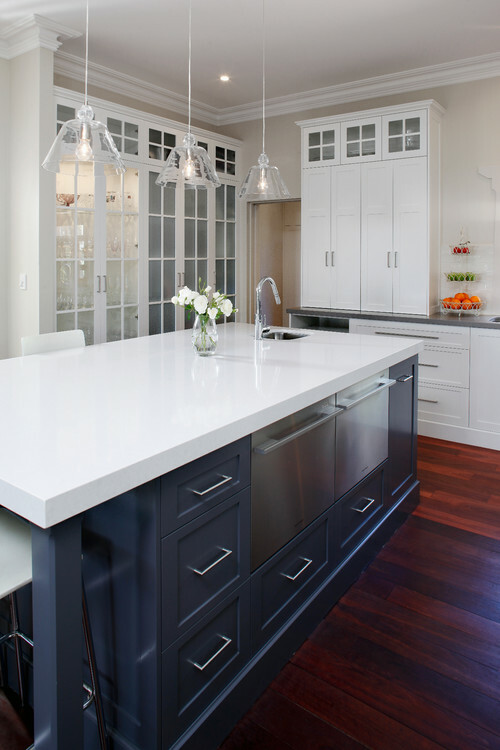 Although every kitchen layout is different, there are reliable guidelines to help you plan where to place everything. And when it comes to appliances, the placement of the dishwasher is key. Ideally, it should be located somewhere that makes loading and unloading quick and easy. But it also pays to ensure that your dishwasher door doesn’t block any work areas or walkways when it’s open. Place it next to the sink. As a kitchen designer, I usually recommend that a dishwasher be positioned next to the sink. There are two reasons for this: The first is that it will make plumbing much easier and less costly, and the second is behavioral. People generally use a “scrape, rinse, load” method to load their dishwasher. This involves scraping leftovers from dishes into the trash (located to one side of, or under, your sink), then giving dishes a quick rinse before loading them into the dishwasher. Consequently, the best placement is on the opposite side of the sink from the scraping area. There are many dishwashers on the market that don’t require dishes to be rinsed before they’re loaded. Choose a side. If you decide to position your dishwasher next to your sink, the next consideration should be whether to put it on the left or right. There is no correct answer; a right-handed person typically will hold a dish in the left hand and use the right hand to scrape or wash the dish, therefore making it easier to load dishes into a dishwasher positioned to the left of the sink. The opposite applies to a left-handed person. Having said that, people are often creatures of habit, so I sometimes find clients prefer to put the dishwasher on the same side of the sink that it was on in their old kitchen, regardless of whether they are left- or right-handed. 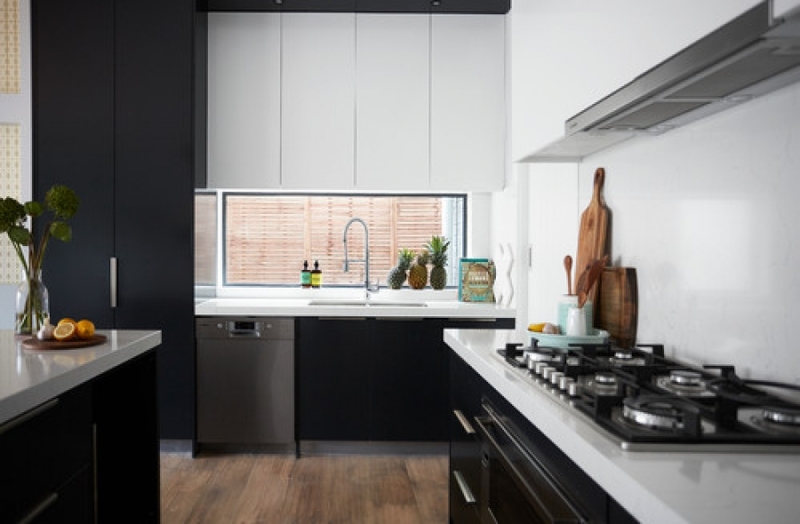 The overall layout of the rest of the kitchen and the location of other appliances is also important to consider, so try not to become wedded to left or right at the expense of creating a poor layout in other respects. Ensure the dishwasher is close to drawers. Always make sure the drawers or cabinets where flatware, glasses and dishes are stored are close to your dishwasher. 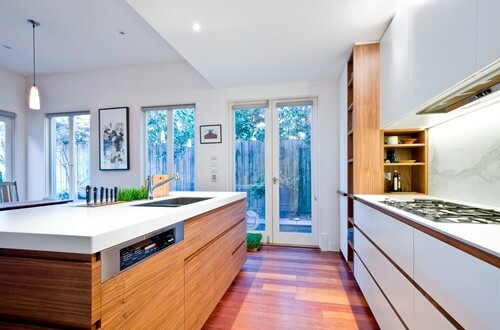 This kind of functionality and practicality is essential to any kitchen design. The location of all kitchen appliances in relation to each other, and to the storage in your kitchen, plays an important role in making it a pleasurable place to work in. Note the distance to nearby cabinets. Aim to have a maximum of one step’s distance between your dishwasher and the storage areas where you are placing dishes and utensils. Your dishwasher can be adjacent to these cabinets and drawers or opposite them; it doesn’t matter as long as you don’t need to move far between them. Check movability within your space. Freedom of movement is an important consideration when designing a layout. 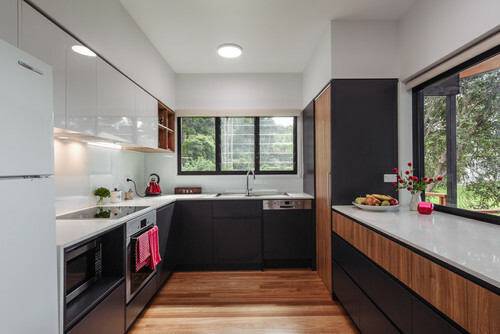 This is especially relevant when it comes to the placement of appliances, such as a dishwasher, that open out into the circulation space, and remain open for a period while they are in use. When planning your kitchen, visualize yourself carrying out daily tasks such as loading and unloading your dishwasher. Try not to position your dishwasher in a location that will block off a main walkway when it’s open. It is also important to consider the location of other appliances, such as a cooktop, in relation to a dishwasher. Avoid having your dishwasher door open into the area where someone stands when using the cooktop — or the sink, for that matter. Having appliance or cabinet doors clash when they are opened is often unavoidable, particularly in an L- or U-shaped kitchen. 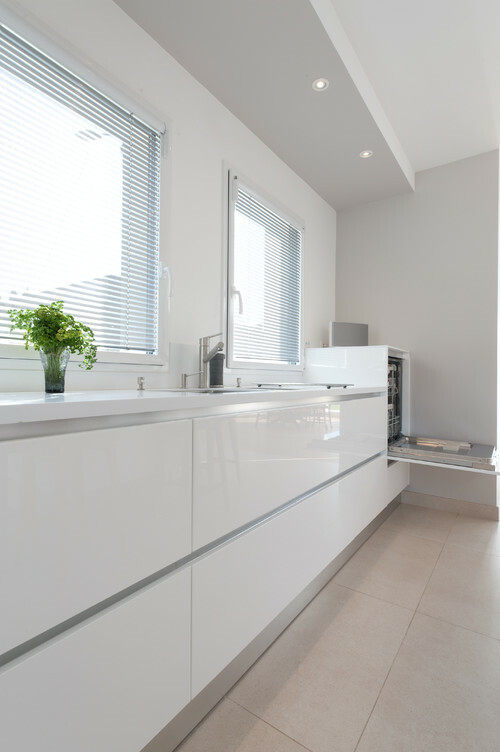 However, it’s worth ensuring that your dish, cutlery and glassware drawers and doors can be fully opened at the same time as your dishwasher door is open to make unloading easy. If your dishwasher is beneath an island counter. In a kitchen with an island, you will probably find the island becomes the spot where dirty dishes are dropped as they are cleared away from outdoor entertaining areas, the dining table or the breakfast bar. For this reason, locating your dishwasher here is a good idea. Dishes can be quickly cleared from the island countertop, rinsed in the sink if preferred and then loaded into the dishwasher without having to move to another area of the kitchen. 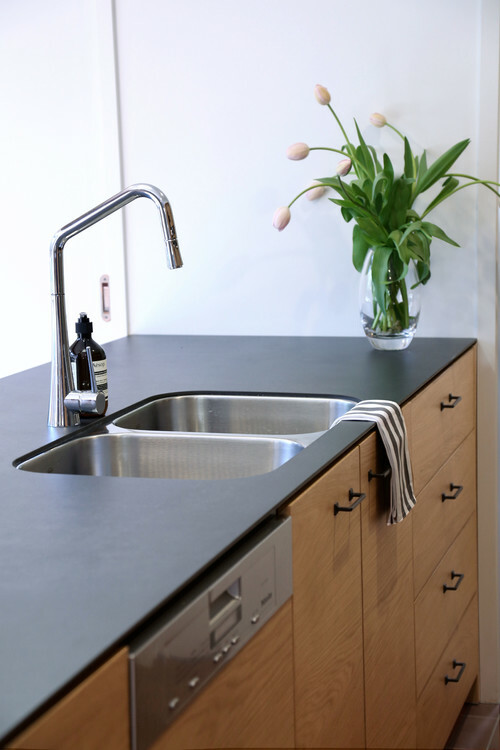 However, it may not always be possible to locate a dishwasher in the center of a room due to plumbing restrictions, particularly if a home is built on a concrete slab. It is worth speaking with your designer and plumber about this at the planning stage because it may be prohibitively expensive. Consider integrating your dishwasher. If you have an open-plan kitchen, you may want to think about concealing your dishwasher, particularly if it could be visible from your living area. In this instance, consider an integrated dishwasher – that is, one specially designed to sit behind a panel that matches the rest of your kitchen cabinetry. There are two main types of integrated dishwashers. One is a semi-integrated, as pictured here, where just the top control panel is visible, with the lower part covered by a cabinetry panel. The other option is a fully integrated dishwasher, as pictured here, giving the illusion that a cabinet or bank of drawers lies behind the cabinet front. In this case, the controls of the dishwasher are located along the top edge of the door and are only visible when it’s open. Or hide it away in a walk-in pantry. 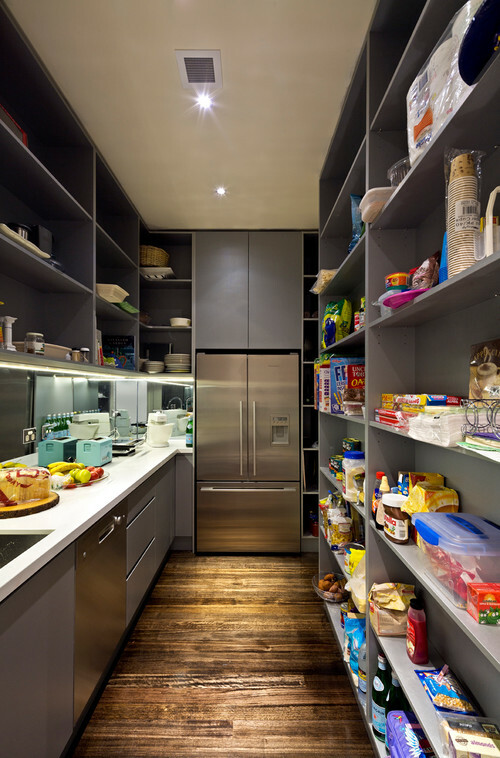 Walk-in and butler’s, or working, pantries are becoming more popular in kitchens, particularly in new homes. As a kitchen designer, I get regular requests from clients that their dishwasher and a second sink be located in their pantry. This is so that all dirty dishes can be taken straight there after a meal, and all large pots and pans can be washed there, leaving the main kitchen neat and tidy and the sink empty to rinse glasses or wash hands. Busy families and larger households might consider having two dishwashers, one in the kitchen for everyday use, and one in the butler’s pantry for extra dishes or on those occasions when guests come over. Think about elevating it. If you dislike bending down to load and unload your dishwasher, this may be the solution for you. Building your dishwasher into a taller cabinet — similar to how you would with an eye-level oven — will be easier on your back. 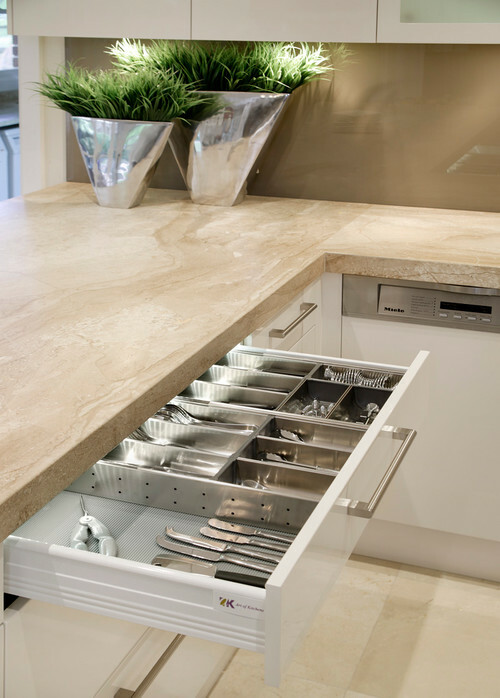 Incorporate a drawer that can be used to store anything from dishwasher tablets to plates or chopping boards below the dishwasher, to make use of the extra space. You can finish the height of the cabinet at the top of the dishwasher or continue it to a higher level with additional storage — or even a microwave space — above the dishwasher. Ensure that the dishwasher is installed correctly and fixed into place to avoid any movement.